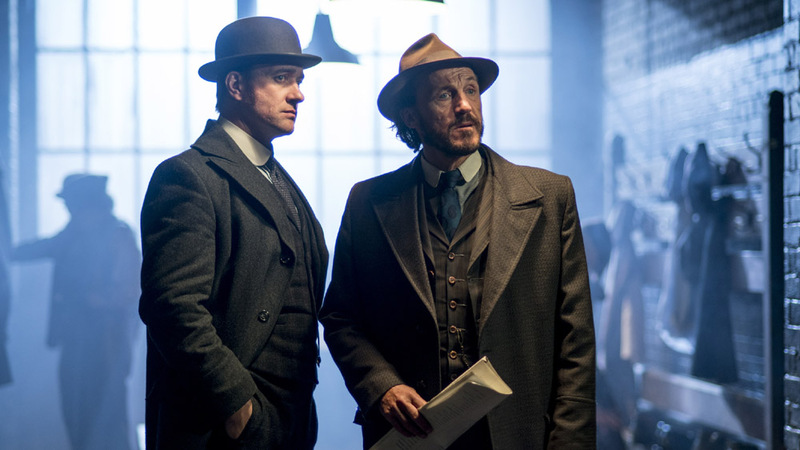 Previously on Ripper Street: Rose and Drake took in little Connor, whom Jackson secretly visits, which does not make Drake happy, when he finds out. Susan’s gotten quite fond of Croker, and vice versa, and Reid might still look into the Isaac Bloom case. Oh, and you may have forgotten (I know I sure did), but waaaay back in season 1, Drake saved a boy, Thomas Gower, from being hanged for murder by enlisting him in the army. This week, it’s all about surrogate parents/mentors and their relationship with those pesky kids. First up: Croker. Susan realises he’s been ripping off the Customs House by helping himself to a few things here and there. She goes to work on Croker’s right-hand man/kind of adopted son and gets him to show her how he gets into the Customs House. He does, and she immediately decides to bring Jackson back and rob the place’s strongroom, even though that’s incredibly dangerous. Croker is not on board with this, but she pressures him, using his newfound affection for her as a sort of stand-in daughter. With Jackson she doesn’t have to exert any pressure at all, because he does whatever she wants no matter how incredibly stupid it is. To wit: she asks to be taken to go see Connor, and he takes her right to the Drakes’ home, where not only Connor, but Rose spot her through the window. Nice job, Susan. Drake and Reid are investigating the murder. A young man named Tanner, recently an employee at the iron works and the star player on its football team, has had his head bashed in by a hammer. The two men got to speak to the foreman, Hackman (oh, hi, Thorne from Game of Thrones!) who’s really sad about Tanner, because the boy was really promising and he was clearly very fond of him. Hackman runs a fairly tight ship at the foundry: no drinking, and the football team is a really big deal. Guess who else works there? Gower! He’s out of the army now, and Drake’s pleased to see the boy seems to have turned out well. He even offers him a job at Leman Street and invites him over for dinner (apparently Rose makes a mean pigeon pie). Gower privately goes to Leman to tell Drake that another player on the team, Wren, absolutely hated Tanner and had a major rivalry going with him. Drake pulls the guy in (drunk) and Wren tells him he never murdered anyone, and oh, by the way, did Drake know Gower’s quite a drinker as well? Quite a drinker is putting it mildly, apparently. Poor Gower was so immensely traumatised by his time in the army he gets black-out drunk whenever possible. After being fired from his job (for drunkenness) he goes to Drake’s and is offered a bed for the night (over Rose’s objections). He then has a really great scene where he cries and accuses Drake of having essentially ruined his life. An investigation of the crime scene unearths a bed that’s been peed on (lovely!) blood spray everywhere, and a bloody shirt hidden underneath the floorboards. Reid’s determined that Gower’s their man and manages to elicit a confession from him under extreme verbal pressure, so it looks like they’ve got their man and Drake is really sad. Jackson, meanwhile, gets to work basically inventing blood spatter analysis (hey, he’s already discovered fingerprinting and blood typing–why not?). He realises that Gower couldn’t be their man, because he and his shirt were lying on the bed at the time of the murder and only got secondary spray. Gower is released and goes to the only place he ever felt safe: Miss Goren’s. She’s playing stand-in mother to a few people this episode, tending to him (and taking him to a rabbi for comfort, which doesn’t get very far) and scolding Costello for her friendship with Matilda, thinking this relationship has ulterior motives for Costello. And it sort of does, but I do think Costello’s friendship is sincere, as is her apology to Miss Goren for this interference. Before he was released, Gower told the Leman Streeters that he went to Tanner’s that night to celebrate, because Tanner had been offered a position on a professional football team and was leaving the ironworks. That, and the fact that Tanner had some kind of pendant ripped off his neck (a St Sebastian pendant that Reid found in Hackman’s office) points the finger of suspicion at Hackman, whose name suddenly seems very on-the-nose. They go to the foundry, where they find him tending the football field, as always. Hackman puts up no resistance, just says that he was responsible for making this boy, and then he was going to leave for greener pastures, and who does that? Um, almost everyone on earth, Hackman. Sometimes, you have to let your kids go. Gower, meanwhile, has just completely disappeared into the bottle. He stumbles along the streets of Whitechapel, until someone–or something–attacks him, stabbing him to death. The Golem is about, it seems. And fare-thee-well, Gower. You were an incredibly sad figure pretty much from day one, and it’s too bad you couldn’t be saved or save yourself.